I still think it needs a third coat, so I'll do that in tomorrow's daylight. Whoa. 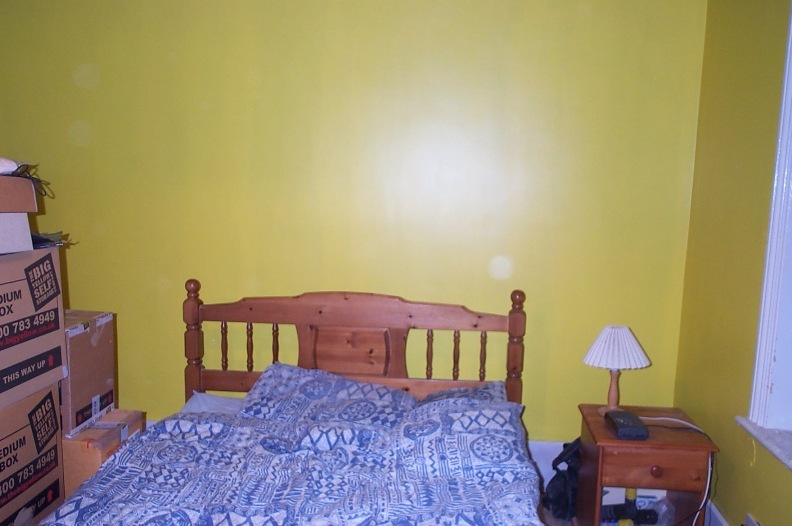 That is... very, very... yellow. I admire your eco-friendly storage solution (on the left hand side). Also ideal for those sudden emigrations. Very cheerful! I am impressed that you can be bothered to move all those boxes etc. between coats. That's been one of the main reasons for delaying the whole process for so long - the actual painting doesn't take too long, but it's a nuisance to keep dragging stuff around and have to keep stepping over things to get from one side of a room to another. Still, once this is all sorted out, I can get a proper wardrobe, and then actually unpack these boxes.